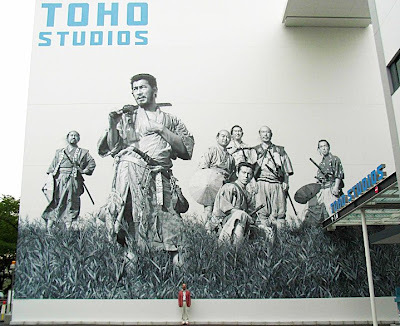 I have received and posted on my blog the image of a large wall painting at the entrance of Toho Studios, in Tokio, recently made by a friend of mine, the artist Hanawa Masao, who lived and worked for some years here in Genova (Italy), which I find quite amazing (both the painting and the artist). Haven't seen Seven Samurai? You are missing out on the seven coolest dudes to ever grace the silver screen. Toshirō Mifune is like James Dean turned up to 11.